GWorkspace is a Workspace Manager for GNUstep. 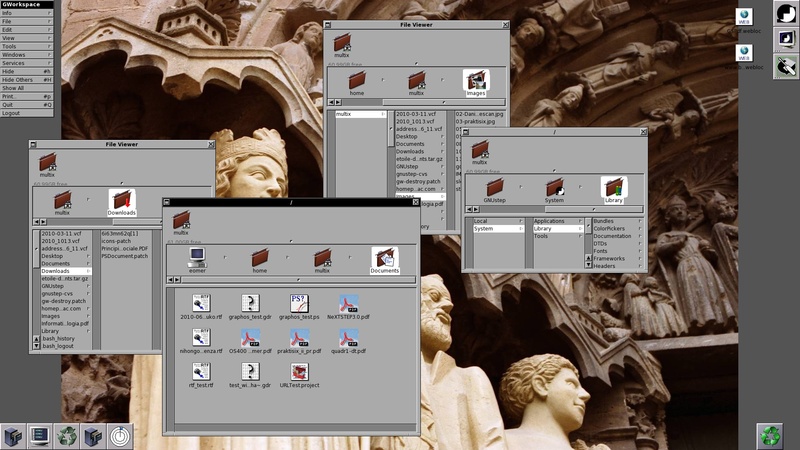 GWorkspace is a clone of the NeXT workspace manager with some added features as spatial viewing, an advanced database based search system, etc. The latest version of Gworkspace (v0.9.4, released July 09 2016) can be download here. Sqlite is needed only needed if GWMetadata is enabled through --enable-gwmetadata. Thus with version 0.8.8 SQLite is no longer a hard dependency. GWMetadata is the metadata indexing and search system which includes the live folders functionality. If you are on Linux and want to use the new inotify-based fswatcher, you can pass --with-inotify to configure. The PDFKit framework (version >= 0.9). Currently it is available only as CVS check-out in the GNUstep Application Project. A release is almost ready. PDFKit is needed to build the pdf contents inspector and to extract metadata from pdf files. System Preferences If you install the GWMetadata system, SystemPreferences is needed to configure it. A contents Inspector for VCF files. It is now distributed with Addresses itself. An Inspector used to preview many types of graphics formats not currently supported by NSImage. It can also by used to preview Type 1 and Truetype fonts. GWorkspace now is maintaned by the GNUstep community.